Retro good looks, combined with powerful performance, make the 44-Inch Concept Ceiling Fan a favorite for residential and commercial use. Offered in two sizes and four finishes, it cools and brightens any space with maximum style! 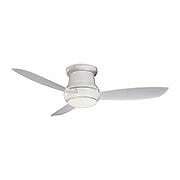 It features a brushed nickel finish, silver blades, and an integrated LED emitter. Should you wish to operate without the light, simply replace the opal glass shade with the included metal cap. The hand-held remote control offers 3 speeds in forward and reverse, as well as a full range light dimmer. An optional wall mounted control is available separately - ask a hardware specialist for details. Retro good looks, combined with powerful performance, make the 44-Inch Concept Ceiling Fan in Oil-Rubbed Bronze a favorite for residential and commercial use. Offered in two sizes and four finishes, it cools and brightens any space with maximum style! 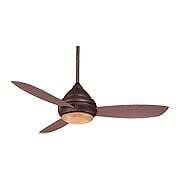 It features an oil-rubbed bronze finish, taupe blades, and an integrated LED emitter. Should you wish to operate without the light, simply replace the pietra glass shade with the included metal cap. The hand-held remote control offers 3 speeds in forward and reverse, as well as a full range light dimmer. An optional wall mounted control is available separately - ask a hardware specialist for details. 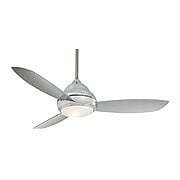 Retro good looks, combined with powerful performance, make the 44-Inch Concept Ceiling Fan in Polished Nickel a favorite for residential and commercial use. Offered in two sizes and four finishes, it cools and brightens any space with maximum style! It features a polished nickel finish, silver blades, and an integrated LED emitter. Should you wish to operate without the light, simply replace the opal glass shade with the included metal cap. The hand-held remote control offers 3 speeds in forward and reverse, as well as a full range light dimmer. An optional wall mounted control is available separately - ask a hardware specialist for details. 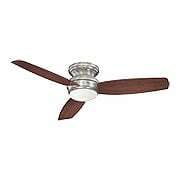 Powerful, sleek and stylish, the 44-Inch Concept II Flush-Mount Ceiling Fan is a perennial best seller. Only 11 1/2-inches in height, it is ideal for rooms with standard 8-foot ceilings, including the living room, bedroom, kitchen and family room! It features a brushed nickel finish, silver blades, and an integrated LED light kit. Should you wish to operate without the light, simply replace the opal glass shade with the included metal cap. The full function remote control offers 3 speeds in forward and reverse, as well as a full-range light dimmer. Powerful, sleek and stylish, the 44-Inch Concept II Flush-Mount LED Ceiling Fan in Oil-Rubbed Bronze is a perennial best seller. Only 11 1/2-inches in height, it is ideal for rooms with standard 8-foot ceilings, including the living room, bedroom, kitchen and family room! 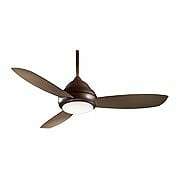 It features an oil-rubbed bronze finish, taupe blades, and an integrated LED light (14W emitter included). Should you wish to operate without the light, simply replace the opal glass shade with the included metal cap. The full function remote control offers 3 speeds in forward and reverse, as well as a full range light dimmer. Powerful, sleek and stylish, the Concept II Flush-Mount Ceiling Fan in Polished Nickel is a perennial best seller. Only 11 1/2-inches in height, it is ideal for rooms with standard 8-foot ceilings, including the living room, bedroom, kitchen and family room! It features a polished nickel finish, silver blades, and an integrated LED light kit. Should you wish to operate without the light, simply replace the opal glass shade with the included metal cap. The full function remote control offers 3 speeds in forward and reverse, as well as a full range light dimmer. 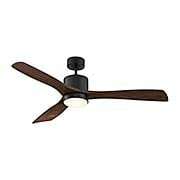 This slightly more traditional version of the popular 44-Inch Concept Flush-Mount LED Ceiling Fan in Oil-Rubbed Bronze suits settings from classic to the contemporary. Wet rated for exterior or interior use, and only 10 3/4-inches in height, it is ideal for rooms with standard 8-foot ceilings, as well as porches, gazebos or other outdoor areas - even ones exposed to rain! It features an oil-rubbed bronze finish, medium stained maple blades, and an integrated LED light kit (14 W emitter included). Should you wish to operate without the light, simply replace the tinted opal glass shade with the included metal cap. The Traditional Concept fan comes with a full function wall control, featuring 3 speeds in forward and reverse, as well as a full range light dimmer. An optional hand-held remote control unit is sold separately - ask a hardware specialist for details. 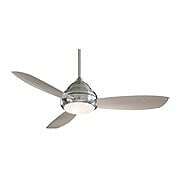 This slightly more traditional version of the popular 44-Inch Concept Flush-Mount LED Ceiling Fan in Pewter Finish suits settings from classic to contemporary. Wet rated for exterior or interior use, and only 10 3/4-inches in height, it is ideal for rooms with standard 8-foot ceilings, as well as porches, gazebos or other outdoor areas - even ones exposed to rain! It features a pewter finish, dark-stained maple blades, and an integrated LED light kit (14 W emitter included). Should you wish to operate without the light, simply replace the opal glass shade with the included metal cap. Retro good looks, combined with powerful performance, make the 52-Inch Concept LED Ceiling Fan in Brushed Nickel a favorite for residential and commercial use. Offered in two sizes and four finishes, it cools and brightens any space with maximum style! It features a brushed nickel finish, silver blades, and an integrated LED light kit. Should you wish to operate without the light, simply replace the opal glass shade with the included metal cap. The hand-held remote control offers 3 speeds in forward and reverse, as well as a full range light dimmer. An optional wall mounted control is available separately - ask a hardware specialist for details. Retro good looks, combined with powerful performance, make the 52-Inch Concept LED Ceiling Fan in Oil-Rubbed Bronze a favorite for residential and commercial use. Offered in two sizes and four finishes, it cools and brightens any space with maximum style! 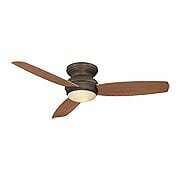 It features an oil-rubbed bronze finish, taupe blades, and an integrated LED light kit. Should you wish to operate without the light, simply replace the pietra glass shade with the included metal cap. The hand-held remote control offers 3 speeds in forward and reverse, as well as a full range light dimmer. An optional wall mounted control is available separately - ask a hardware specialist for details. Retro good looks, combined with powerful performance, make the 52-Inch Concept LED Ceiling Fan in White Enamel a favorite for residential and commercial use. Offered in two sizes and four finishes, it cools and brightens any space with maximum style! It features a white enamel finish, matching white blades, and an integrated LED light kit. Should you wish to operate without the light, simply replace the opal glass shade with the included metal cap. The hand-held remote control offers 3 speeds in forward and reverse, as well as a full range light dimmer. An optional wall mounted control is available separately - ask a hardware specialist for details. Retro good looks, combined with powerful performance, make the 52-Inch Concept I Ceiling Fan in Oil-Rubbed Bronze a favorite for residential and commercial use. Wet rated for exterior or interior use, it's ideal for porches, gazebos or other outdoor areas - even ones exposed to rain! The sleek body style with integrated blades is highly wind resistant, and well suited to breezy coastal or storm-prone areas. This Concept Fan features an oil rubbed bronze finish, taupe blades, and an integrated LED emitter. Should you wish to operate without the light, simply replace the pietra glass shade with the included metal cap. The full function wall control offers 3 speeds in forward and reverse, as well as a full range light dimmer. An optional remote control is available separately - ask a hardware specialist for details. Retro good looks, combined with powerful performance, make the 52-Inch Concept I Ceiling Fan with LED Light Kit in White Enamel a favorite for residential and commercial use. Wet rated for exterior or interior use, it's ideal for porches, gazebos or other outdoor areas - even ones exposed to rain! The sleek body style with integrated blades is highly wind resistant, and well suited to breezy coastal or storm-prone areas. 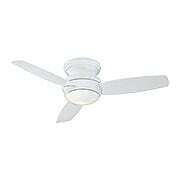 This Concept Fan features a white enamel finish, matching white blades, and an integrated LED emitter. Should you wish to operate without the light, simply replace the opal glass shade with the included metal cap. The full function wall control offers 3 speeds in forward and reverse, as well as a full range light dimmer. An optional remote control is available separately - ask a hardware specialist for details. 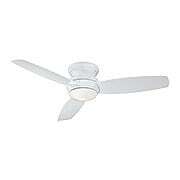 Powerful, sleek and stylish, the Concept II flush mount fan is a perennial best seller. Only 11 1/2"in height, it's ideal for rooms with standard 8' ceilings, including the living room, bedroom, kitchen and family room! It features a brushed nickel finish, silver blades, and an integrated LED light kit (14 W emitter included). Should you wish to operate without the light, simply replace the opal glass shade with the included metal cap. The full function remote control offers 3 speeds in forward and reverse, as well as a full range light dimmer. Powerful, sleek and stylish, the 52-Inch Concept II Flush-Mount Ceiling Fan in Oil-Rubbed Bronze is a perennial best seller. Only 11 1/2-inch in height, it is ideal for rooms with standard 8-foot ceilings, including the living room, bedroom, kitchen and family room! It features an oil-rubbed bronze finish, taupe blades, and an integrated LED light kit (14 W emitter included). Should you wish to operate without the light, simply replace the opal glass shade with the included metal cap. The full function remote control offers 3 speeds in forward and reverse, as well as a full range light dimmer. Powerful, sleek and stylish, the 52-Inch Concept II Flush-Mount Ceiling Fan in Polished Nickel is a perennial best seller. Only 11 1/2"in height, it's ideal for rooms with standard 8' ceilings, including the living room, bedroom, kitchen and family room! It features a polished nickel finish, silver blades, and an integrated LED light kit (14 W emitter included). Should you wish to operate without the light, simply replace the opal glass shade with the included metal cap. The full function remote control offers 3 speeds in forward and reverse, as well as a full range light dimmer. 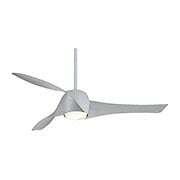 Powerful, sleek and stylish, the Concept II flush mount fan is a perennial best seller. Wet rated for exterior or interior use, and only 12" in height, it's ideal for rooms with standard 8' ceilings, as well as porches, gazebos or other outdoor areas - even ones exposed to rain! 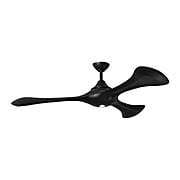 It features an oil-rubbed bronze finish, taupe blades, and an integrated LED emitter. Should you wish to operate without the light, simply replace the pietra glass shade with the included metal cap. The full function wall control offers 3 speeds in forward and reverse, as well as a full range light dimmer. An optional remote control is available separately - ask a hardware specialist for details. 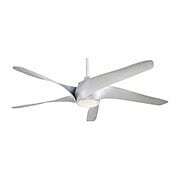 Powerful, sleek and stylish, the Concept II Flush-Mount LED Ceiling Fan in White Enamel is a perennial best seller. Wet rated for exterior or interior use, and only 12-inches in height, it is ideal for rooms with standard 8-foot ceilings, as well as porches, gazebos or other outdoor areas - even ones exposed to rain! It features a white enamel finish, matching white blades, and an integrated LED emitter. Should you wish to operate without the light, simply replace the opal glass shade with the included metal cap. The full function wall control offers 3 speeds in forward and reverse, as well as a full range light dimmer. An optional remote control is available separately - ask a hardware specialist for details. 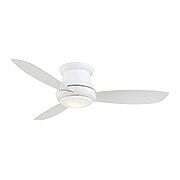 This slightly more traditional version of the popular 52-Inch Concept Flush-Mount LED Ceiling Fan in White Enamel suits settings from classic to contemporary. Wet rated for exterior or interior use, and only 10 3/4-inches in height, it is ideal for rooms with standard 8-foot ceilings, as well as porches, gazebos or other outdoor areas - even ones exposed to rain! It features a white enamel finish, matching white blades, and an integrated LED light kit (14 W emitter included). Should you wish to operate without the light, simply replace the opal glass shade with the included metal cap. 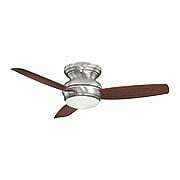 This slightly more traditional version of the popular 52-Inch Concept Flush-Mount Ceiling Fan in Oil-Rubbed Bronze Ceiling Fan suits settings from the classic to the contemporary. Wet rated for exterior or interior use, and only 10 3/4-inch in height, it's ideal for rooms with standard 8-foot ceilings, as well as porches, gazebos or other outdoor areas - even ones exposed to rain! It features an oil-rubbed bronze finish, medium stained maple blades, and an integrated LED light kit (14 W emitter included). Should you wish to operate without the light, simply replace the opal glass shade with the included metal cap. This slightly more traditional version of the popular 52-Inch Concept Flush-Mount LED Ceiling Fan in Pewter Finish suits settings from classic to contemporary. Wet rated for exterior or interior use, and only 10 3/4-inches in height, it is ideal for rooms with standard 8-foot ceilings, as well as porches, gazebos or other outdoor areas - even ones exposed to rain! It features a pewter finish, dark-stained maple blades, and an integrated LED light kit (14 W emitter included). Should you wish to operate without the light, simply replace the opal glass shade with the included metal cap. The minimal design of the Amherst Ceiling Fan is a great choice for any modern home. 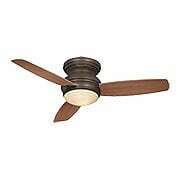 It features solid wood blades, an integrated dimmable LED light, and sleek motor housing. Comes complete with handheld remote control. The handsome Artemis 58-Inch Three Blade LED Ceiling Fan makes a dashing addition to contemporary and traditional interiors alike. Three flowing blades wrap the housing, and the integrated light features a tinted opal-glass shade. The considerable blade span is ideal for larger spaces, and you can easily match your decor with your choice of ten finishes. Comes complete with full-function wall control and LED light kit (17 W emitter included). The handsome Artemis XL5 62-Inch LED Ceiling Fan makes a dashing addition to contemporary and traditional interiors alike. Five flowing blades wrap the housing, and the integrated light features an etched-opal glass shade. The considerable blade span is ideal for larger spaces, and it's available in your choice of a distressed Koa, silver, or white finish. Comes complete with full-function handheld remote control and one LED light kit (17 W emitter included). With its stunning contours and smooth surface, the Bubble Ceiling Fan is a fitting choice for modern interiors. It features glossy finishes, an energy efficient reversible DC motor, and LED lamp that can be installed with a flat cap when no light is required. Comes complete with 6-speed hand-held and wall-mountable remote control.